A burst pipe has the potential to cause a major flood in your home, requiring the assistance of the water damage Old Hickory experts at 911 Restoration Middle Tennessee. When it comes to flooding issues, we always provide our customers with same day services, no matter what time you call. Our office is available 24/7/365, so you can contact virtually any time and you will receive help within 45 minutes or less, depending on your location. We never want to make you wait long for help, so call our water damage Old Hickory unit today and we will provide you with a free home inspection. Our water damage Old Hickory agents want homeowners to understand the complexity of their piping system. It is important to take care of your pipes, especially in the winter, to prevent bursts from occurring. Insulate your pipes to prevent cold air from freezing them. If the area is sufficiently dry, use heated tape, a space heater or a heat lamp to keep the pipes dry. Keep your faucets flowing at a slow drip to constantly keep warm water flowing through the pipes. 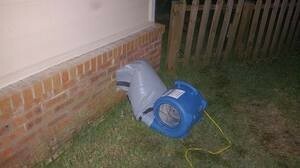 Also insulate the drain lines in basements and crawlspaces. Before thawing a frozen pipe inspect it to make sure there are no cracks present. Use a hair dryer or space heater to slowly thaw a frozen pipe. Call our Old Hickory water extraction specialists as soon as your notice you have any plumbing issues and we will make sure you get the prompt assistance you need. Our water damage Old Hickory workers treat every customer with the utmost respect. We understand how overwhelming it can be when your home is submerged in floodwater, and we are here to make things as easy as possible. It is important to be as accessible as possible so we can answer any questions and quell any concerns you may have about the home restoration process. If you are worried about payment, then we will reassure you that we work with all insurance company. Our water damage Old Hickory members will even help you with your insurance policy, filing your claim for you if need be. Call our water damage Old Hickory team with 911 Restoration Middle Tennessee when you need affordable flood damage services and we will get you the fresh start you deserve today!